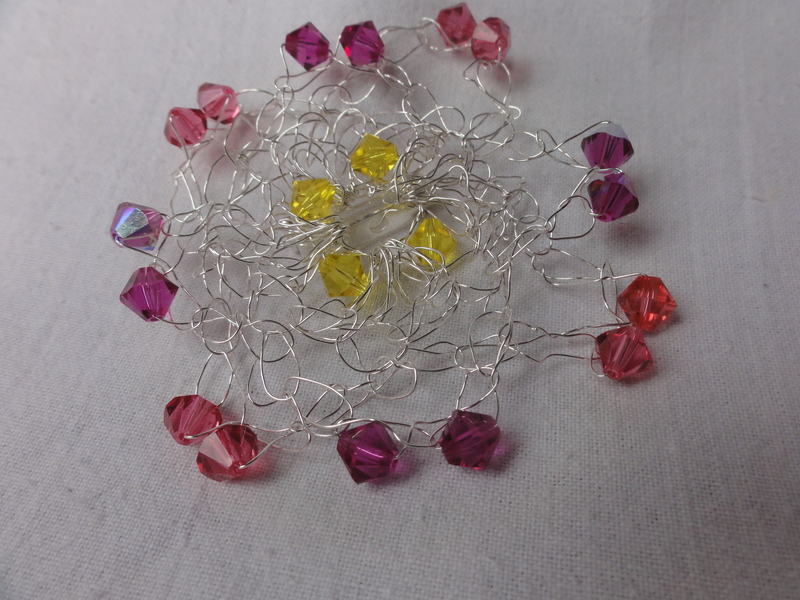 Step 1: You need to thread the beads/crystals onto the wire in the reverse order that you want them to appear i.e. I put the yellow crystals on last as these were the first ones that I would be using in my pattern. Step 2: Crochet 4 chains dropping a crystal into place just before you pull the loop through. Slip stitch to first chain. Step 3: *4 Trebles into space between the first 2 crystals, Repeat 3 more times from * so that there are 4 trebles between each crystal. Slip stitch to the first treble. Step 4: *2 chain, 2 chain with a crystal dropped into place before you pull the wire through to complete the stitch, 1 chain, miss three treble. Slip stitch into 4th treble. Repeat from* three more times putting the last slip stitch into the treble where you started from. Step 5: Keeping the chain behind the previous round * 3 chain, 2 chain with a crystal dropped into place before you pull the wire through to complete the stitch, 2 chain, miss three treble. Slip stitch into 4th treble (ensuring you are behind the previous loop). Repeat from* three more times putting the last slip stitch into the treble where you started from. Cast off. One of the benefits of working with wire (and slightly thicker wire), is that it holds its shape. I wanted to make this brooch 3D so I pulled the front 4 chains forward slightly and they do stay forward a bit. I am sure that you could add more loops to make it more 3D. Have a go and let me know what you come up with. Good luck.